The first operational B-1B Lancer, affectionately known as the “Bone” (B-One), showed up at Dyess Air Force Base (AFB), Texas, in June 1985. It can operate at 60,000 feet with a range of more than 7,000 miles. It holds 61 world records for speed, payload, and distance, and in February 2012, a Bone completed the type’s 10,000th combat mission in the skies over Afghanistan. The B-1’s status as the Air Force’s go-to bomber is evident in both the tonnage it has dropped and the investments made in it through the end of 2011. The milestone combat mission sortie over Afghanistan demonstrates how the B-1B has become a precision-weapons platform, as well as its successful evolution from a Cold War long-range nuclear strike aircraft to a conventional bomber. One hundred B-1Bs were built, and 66 are currently in service. Over Afghanistan the Bone’s high speed (compared to the B-52H) enables it to cover the entire country, hustling from one region to another to deliver smart bombs, protecting troops, and projecting power in disparate locations. As important as its swing-wing airframe, powerful engines, and bomb-load capacity is its recently upgraded capability to deliver precision weapons. Upgrades completed in 2011 include radar modification under the Reliability and Maintainability Improvement Program, which updates the aircraft’s offensive radar system, and the Sustainment Block-14B/Laptop Controlled Targeting Pod Phase II upgrade, which integrates the new GBU-54 Laser Joint Direct Attack Munition (JDAM). Together, these have increased the B-1B’s ability to attack moving targets on land and at sea. The addition in recent years of the Joint Air-to-Surface Standoff Missiles-Extended Range (JASSM-ER) and BLU-129 warheads for the Mk. 82 have given the Bone a wider precision arsenal that extends to the maritime environment. Last September the B-1B became the only bomber to successfully conduct maritime testing when it dropped 10 laser-guided JDAMs onto high-speed maneuverable surface targets in the Gulf of Mexico. 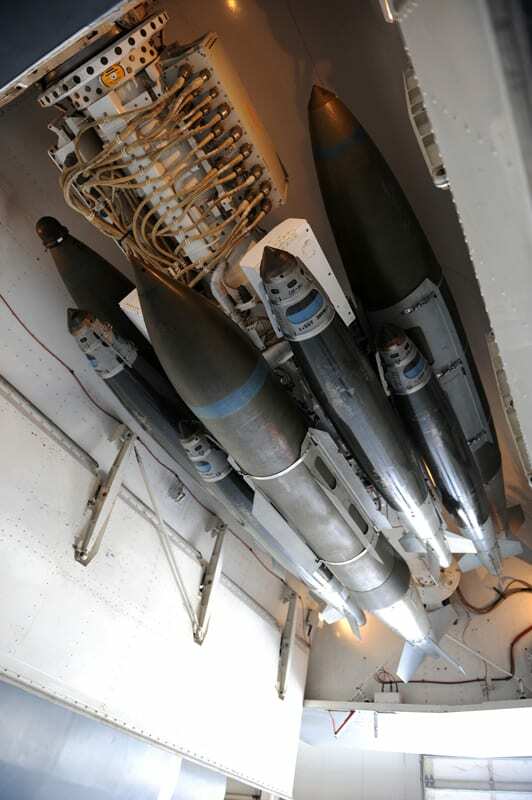 Likewise, the B-1’s AGM-158 JASSM carriage capability allows it to engage multiple targets. Early this year, Maj. Brian Owen, 77th Weapons Squadron instructor with the 7th Bomb Wing at Dyess AFB, asserted that the B-1 is the most capable JASSM employment platform in the world. A decade-long stream of such upgrades has enabled the Bone to shoulder a major portion of the strike burden in Southwest Asia, dropping 42 percent of the weapons in Operation Enduring Freedom despite flying just 16 percent of the sorties as of 2010, according to a Feb. 17 Dyess AFB “B-1 Year in Review” article. While B-1s accounted for only 2.5 percent of the sorties flown during Operation Iraqi Freedom and the more recent Operation New Dawn (wherein B-1s from Ellsworth AFB flew trans-Atlantic missions to Libya in support of NATO), they delivered 45 percent of the munitions dropped, the article stated. Further potential upgrades include the Multiple Ejector Rack (MER), which completed a demonstration test in early 2011. The MER would incorporate 16-carry modified rotary launchers, increasing the number of 500-pound Joint Direct Attack Munitions and Laser Guided JDAMs carried by the B-1 from 15 to 48, a 320 percent increase in capability. The B-52 Stratofortress, B-2 Spirit, F-16 Fighting Falcon, and F-18 Hornet carry JASSM as well, but the Bone’s ability to carry 24 missiles compared to 16 by the B-2, 12 by the B-52, and only two by the fighters makes it an exceptional standoff platform augmented by superior speed and loiter capability. Such qualities are not only in demand in Afghanistan. With 2011’s Gulf of Mexico tests in mind, the USAF has surely not missed the B-1’s long-range strike advantages offshore around the Pacific Rim and Asia. Careful husbanding of the available airframes and continuous upgrades will likely keep the Bones rolling for decades to come. America’s ingenuity and dedication in a proven system, why change how we operate when we produce this type of exceptional equipment? Thank you Ronald Regan for resurrecting a project that had been killed by Jimmy Carter. The interesting thing is that the B-1A program, canceled by Carter, envisioned a high-altitude, supersonic bomber, and part of the reason for its cancellation was the threat of faster Soviet fighters like the MiG-25, as well as newer Soviet missiles. The B-1B program, as revived by Reagan, was intended to penetrate Soviet air defenses down in the weeds. It also incorporated more stealth features that reduced its RCS vs. the B-1A, but one of the compromises was fixed engine inlets rather than variable geometry inlets, which were great for speed, but bad for stealth. Of course, this made the B-1B stealthier but slower than the B-1A.